I've written before about how I was one of those people. My federal student loans were a constant source of stress, and after doing the math I figured I was paying more than 30 percent of my income every month in loan payments. And because of high interest rates, I was deeper in debt than when I graduated. And then came my epiphany, courtesy of President Obama and his 2014 State of the Union address: "We're offering millions the opportunity to cap their monthly student loan payments to 10 percent of their income," the President said. That opened my eyes to the opportunities out there, and to the importance of keeping informed about your rights and options. Loan servicers, the companies that manage student loans for the Department of Education, don't have a mandate or incentive to tell borrowers about these programs. And borrowers don't get to choose their servicers, either. And so, with that in mind, here are three of the best sources for information that can help if you're having trouble paying your loans, or you're just confused about how the process works. Did you know that different loans have different grace periods, or that there are opportunities — in some cases — for loan forgiveness? No? Well, the Institute for College Access & Success has a tip sheet for recent grads to explain these and other key points that can help you make good decisions. The federal Consumer Financial Protection Bureau has built a question-by-question tool for getting you more familiar with your loans and understanding how you can pay them off. That's no matter if your loans are federal — through the government — or private through a bank. Studentloans.gov has a helpful payment estimator to figure out which of the (many) repayment plans might be best for you. Enter your annual income, your remaining loan balance, your interest rate, and let the machine do its magic. These are just estimates, but can be very helpful. As we've pointed out before on NPR Ed, there are five income-driven repayment plans from the Department of Education — most of which come with a chance for loan forgiveness. Recent findings show that, often, when borrowers do manage to find out about these plans, figuring out how to get into and stay in the programs can be another headache. That conclusion is from the CFPB, which asked for comments from the public last year. It was the first time borrowers had a place to report their experiences with their loans and their servicers. And they had a lot to say: The bureau got more than 30,000 comments. Borrowers reported "a wide range of sloppy, patchwork practices that can create obstacles for repayment," the bureau said. Many people reported that their records were lost, or customer service didn't have the latest information. That's just the beginning. The bureau suspects that problems with servicers have left borrowers vulnerable to scams. Reading through the comments, it seems all too familiar. I'm one of the 10 million borrowers who have seen their servicer change in the past five years. Mine changed without notice when I tried to enroll in the Public Service Loan Forgiveness program. Then my records were lost and my payments more than doubled. Every time I spoke to someone in customer service, they had a different idea of how to fix the situation. But I've been diligent. I've lowered my payments and I'm on the road to loan forgiveness. While I once wondered if taking on so much debt to work at a nonprofit news network was worth it, I now think it was. Are you still paying off student loans? If so, listen up. Today, the average student borrows about $35,000. 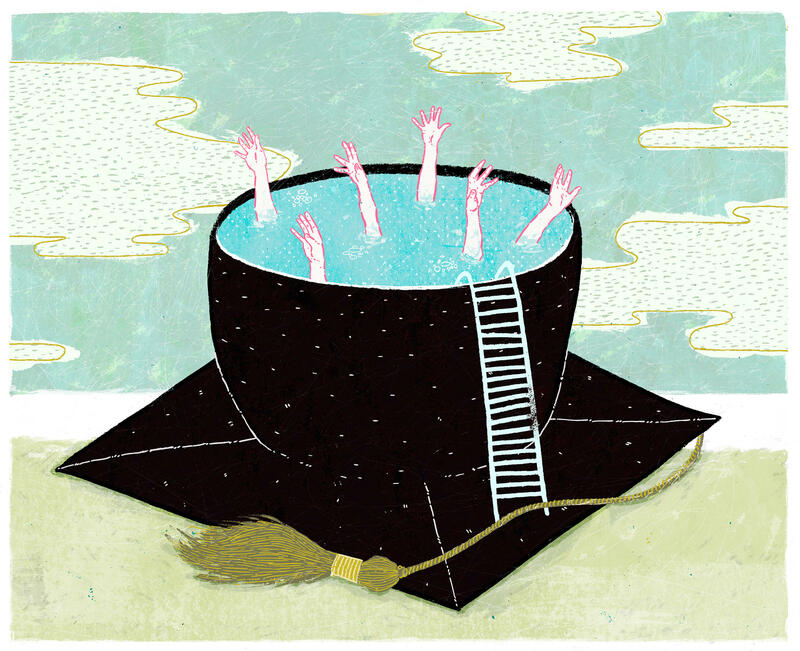 Add a graduate degree and you can easily leave school more than $100,000 in debt. Many young Americans are saddled with hefty monthly payments, and economists say they're delaying buying homes and starting families. Happily, there are programs out there to help people pay back their loans. Acacia Squires from the NPR Ed team stopped by to talk about students and their debt. ACACIA SQUIRES, BYLINE: There was a recent survey from LendEDU, which is an online resource for people who have student loans, that showed a couple of surprising numbers. Number one, only about 8 percent of students could tell you what their interest rates were. Only 6 percent of students surveyed could tell you what their repayment terms were. MARTIN: What? I mean, we can't just say that this is because they don't have the resources to understand these things. I mean, the information's out there. They just don't know how to find it or they're choosing not to. SQUIRES: The information is out there, but it's really complicated. I have to say, I'm somebody with student loans myself and I've been navigating this world for a long time. MARTIN: All right, walk back in time to 2014. You were watching the State of the Union and something caught your ear. Tell me about that. SQUIRES: I was watching the State of the Union for work, I should say. So I was listening very attentively. And at one point, President Obama said something like we're making it possible for millions of people to lower their monthly payments for student loans to 10 percent of their income. I did some quick sort of back-of-the-napkin math, and I realized I was paying more like 40 percent of my income every month in student loans. MARTIN: Wow. What are the resources out there to fix that? SQUIRES: It turns out that he was talking about one of a handful of different repayment options that are tied to your income. They're called income-driven repayment plans. And what they do is they take into account the money that you make in order to calculate every month what you pay back. MARTIN: So walk me through just one of them. Like, what's an example of a really good resource people should know about? SQUIRES: OK, so one of them is studentloans.gov. They've got a loan calculator that you can input your information into. You tell them how much you make every year, what interest your loans are at and how much outstanding debt you have. Then they do a calculation and they tell you all of the different ways that you can pay back your loans. So just as an example, Rachel, I put in a couple of what seemed like pretty average numbers. For the standard repayment plan, it's asking that you pay back $462 a month. For the pay as you earn plan, which is what President Obama was talking about, it's $186 a month. MARTIN: That means, though, they're going to pay that for more years. The life of their loan extends. SQUIRES: Exactly. The life of the loan extends, but I should say, too, that a lot of these programs, including pay as you earn, come with a forgiveness option. So after 20 or sometimes 25 years, your loans can be forgiven. MARTIN: But you have to qualify. Not everybody qualifies for that. SQUIRES: Not everybody qualifies. And we should be very careful in saying that these are for federal loans, not private loans that you take out from a bank. MARTIN: OK, clearly the federal government understands that this is an issue. What are they doing to be more transparent about these different resources? SQUIRES: Yeah, there's a lot of pressure right now on the U.S. Department of Education to be more transparent, to advertise these programs to borrowers and to get servicers on board to do the same thing. The Consumer Financial Protection Bureau last year opened up a public forum to ask borrowers what kinds of issues they were running into, and they got more than 30,000 comments. So now they have a lot of ideas on how they can move forward and fix these things. MARTIN: NPR's Acacia Squires from the NPR Ed team. Thanks so much, Acacia. SQUIRES: Thank you for having me, Rachel. Transcript provided by NPR, Copyright NPR.